For one, being able to accomplish such a feat is a clear sign of physical fitness. In addition, if you are planning to run a marathon anytime soon, there is no better way to train than to speed up your technique. On average, an adult will need to take about 222 steps per minute to complete a mile in seven minutes. 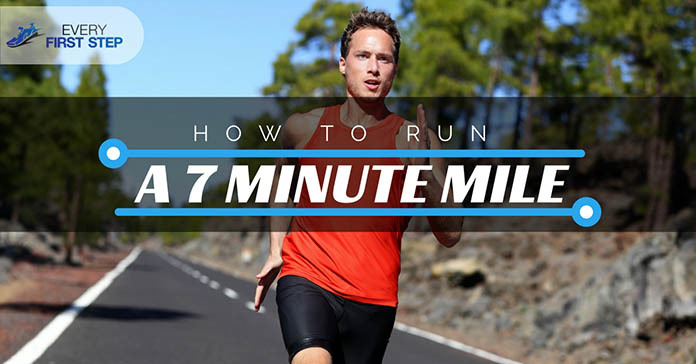 Here are some fantastic tips on how to run a 7 minute mile. Interval running is an excellent way to speed up your pace and increase your endurance. To do this, you will need to alternate between your regular pace, a jog and the fastest you can. You can start with 30-second intervals and then slowly reduce this. Here is an easy to follow interval running routine. ​For your body to be at its top fitness level, it is important that your muscles are all worked out. To accomplish this, you will need to include other forms of training in your workout routine. These sports will exercise different groups of muscles. One way to improve your﻿ endurance is to include long distance runs in your routine. Since running intervals can help you increase your pace, it doesn’t help with your endurance. Getting your body used to run a certain amount of miles will improve your endurance greatly. Try increasing your mileage weekly by about half a mile. ​Training your body to adjust to different running surfaces is a great way to get ready for a 7 minute mile. There is no shortcut to training your body to be able to accomplish a 7 minute mile; it has to be done gradually. Patience is the key in this matter. Start by making it a goal to beat your speed by 30 seconds and when you accomplish that, go for another 30 seconds. You probably know yourself enough to develop a fixed plan that will ensure you stick to your goals. You need to set yourself on a path that you cannot deviate from. Include in your plan things such as and what kind of running you will be doing on each day. ​No matter the distance of your run, always carry water with you. Failure to stay hydrated can result in you collapsing during your run. The more dehydrated your body is, the higher the chances of your muscles from malfunctioning. If you aren’t comfortable carrying a water bottle, there are always hydration belts and the like that are less cumbersome. Make sure you only drink your water when you feel thirsty. ​There is nothing more fulfilling than being able to calculate how many miles you have run. Make sure you get yourself a logbook where you can record all the miles you run every week. Getting your accomplishments down in writing is an amazing way to keep motivated. Motivation is something you will need if you are to succeed in your 7 minute mile run. ​Before you run, make sure you have eaten enough to sustain you throughout your run. A runner should have a diet of mostly fruits and vegetables including fish and dairy. Although you ought to be energized for your run, also guard against being too full. Aside from eating well, getting enough sleep is also very important. Try and get at least seven hours of sleep daily. This way, your muscles will be in their optimal condition. Always remember that the quality of your running shoes may be what prevents you from success. Never sacrifice quality for the price and always be willing to spend more on a good shoe. ​These are just some tips to help you accomplish your goal of running a 7 minute mile. Remember that your body is capable of accomplishing anything you set your mind on. All you need is the right training routine, a body at its peak of fitness and motivation. How did you find this article? Have you set a 7 minute mile run as your goal? What are you doing to accomplish it? We’d love to hear your thoughts in the comments below. Also, make sure to share this information with family and friends.